A flexible walk that takes in the Hole of Horcum, Newton Dale, views across the high moors and a climb up Blakey Topping. Start from the car park at the top of the Hole of Horcum. Cross over the main road (carefully!) and follow the part north along the edge of the Hole. Here you are on the edge of the Tabular Hills. The road continues on towards the Saltergate Inn and the high moors. 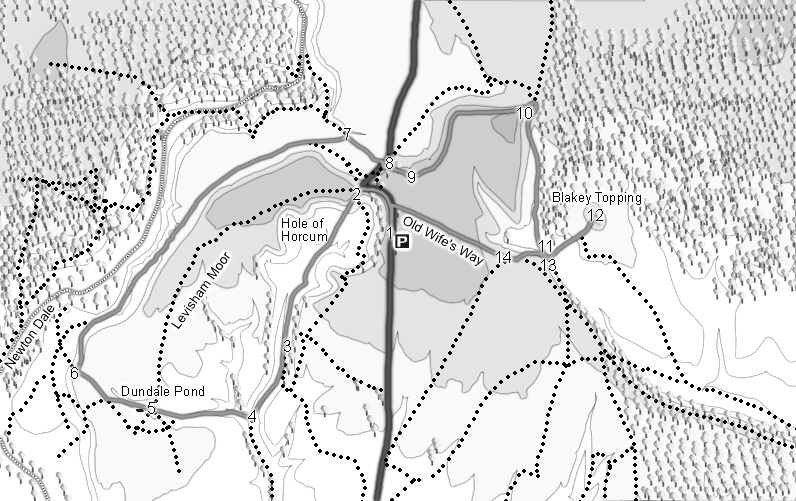 We are going to turn south, heading down the obvious path into the Hole of Horcum. Take care, as this path is becoming quite eroded. At the bottom of the slope, continue along the path down the length of the Hole of Horcum. At the southern end of the hole, the path comes close to some woods. Avoid any path that enters the trees, and keep heading down the valley. At the end of the woods, the path continues along side the stream. At the obvious side valley, cross over the stream and head west up Dundale Griff. The stream here has carved itself an impressive gully, seen to the right of the path as you climb up onto the southern flank of Levisham Moor. Dundale Pond is just beyond a crossroad in the path. At the crossroads you can follow this route or if you want to walk across Levisham Moor, turn right. Otherwise, continue onwards past the pond. As you walk west beyond Dundale Pond, you will begin to glimpse the view into Newton Dale. When you reach the top of the escarpment, turn right to follow a track that runs north down the side of Levisham moor onto the shoulder of land between the valley bottom and the moor. At the base of the slope, you can divert to Skelton Tower, clearly visible on the edge of the valley, or follow the main path north. Follow the path along the base of Levisham Moor until you reach the northern edge of the moor. Avoid the path that heads south east around the base of the moor and continue on until you meet a path coming up out of Newton Dale. Turn right onto this path and head back towards the A169. Here you have two choices. If you want to cut the walk short, then walk south along the side of the road back to the car park (the path marked through the woods was closed when the author last visited in the summer of 2005. If it has been restored, then take that path instead). To continue on with the rest of the walk, cross over the A169 and look for a path that enters the woods east of the road. Once in the woods follow the path to your left. This path makes a quick (steep!) ascent of Saltergate Brow. At the top of the path through the woods you will emerge onto the edge of some farmland. Head east along the edge of the Brow, cutting through a narrow piece of woodland at the edge of a field). Follow the path along the edge of the ridge to the summit (Whinny Nab). The views from here are particularly impressive. The path continues down the corner of the escarpment to Malo Cross. From Malo Cross a track heads south close to the escarpment. Take the path just to the east (left) of this track, closer to the edge of the forestry land. This is marked as solid forest, but large parts of it had been cleared in the summer of 2005. The footpath continues on to Newton Foot farm. At the southern edge of the plantation, you can cut a corner to a gate on the lane towards Blakey Topping. Turn left onto the lane. You are now heading directly towards Blakey Topping. There is an obvious path up the western side of Blakey Topping. This path is steep, but the climb doesn't go on for very long, and is worth it for the views from the top. On top of the hill, a path leads to the north and south ends of the Topping. I'd suggest walking to both ends, and perhaps stopping for a rest up here. Head back towards Newton Foot farm. Pass through the farm, and follow the tarmac road heading west up the side of Newgate Brow. At the top of Newgate Brow follow the path west, close to the edge of a side valley, compete with tiny reservoir. Follow this part all the way back to the A169, then turn left to return to the car park. This author almost always finishes a walk in this area with a meal at the Saltergate Inn, passed by earlier in the walk. At step 5, turn right onto the path over Levisham Moor.